Last week I began to draft a blog post about the mortgage deeds of Frank L. Colomy and how that shed some light on his life and his family. As with most of my posts, I decided to look over the source documents again more closely. Boy, did that open a can of worms! What I was originally going to post has been put aside as I realized that I really need to take a much closer and more detailed look at these deeds. Additionally, what I’ve found seems to indicate that I need to do more research, including some in-person visits to Lynn, Massachusetts, which I’m not sure when I’ll be able to get to do. So the story will have to wait, but I can promise, it looks like a great one! 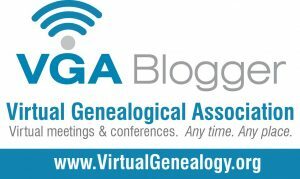 For now the genealogical adage to go back and look at your documents again continues to hold true! In the 1903 Lynn, MA Directory, I found that Bertha French was living at 63 Autumn Street (where her mother Jennie and stepfather James Starbard lived). 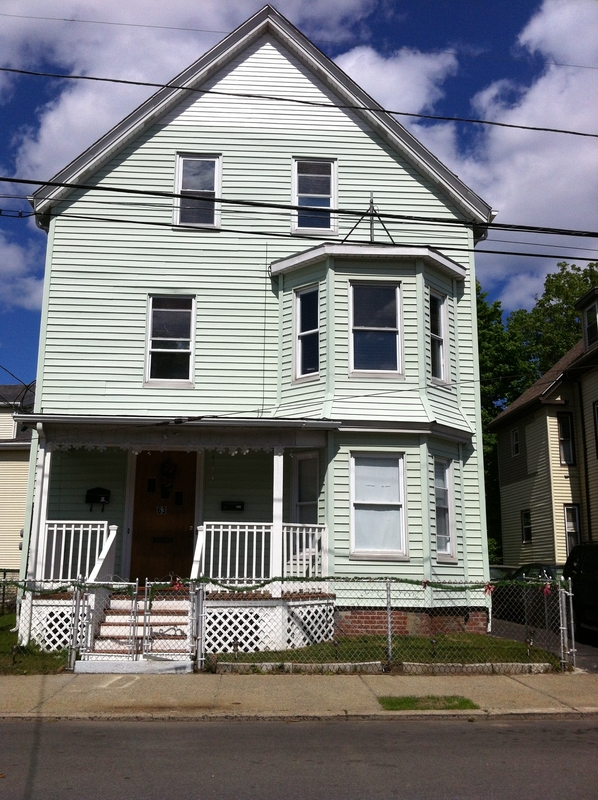 It looks like Bertha lived with her mother until about 1905, then in other locations in Lynn. 63 Autumn Street, Lynn. Author’s collection. So Bertha was at least separated from Frederick after about three years of marriage. Although I still don’t know when the divorce took place, this clue narrows down the timeframe a bit. I could have included Ivory Goodwin’s probate details in my post about him and Jerusha, but I thought it would be a good idea to go through the exercise of analyzing the probate file itself. The file is fourteen pages long, and a number of those pages are undated envelopes to hold the other documents in the file. The pages appear to be out of chronological order, so I will try to review them in order. As we know, Ivory passed away on February 19, 1866 in Berwick, York County, Maine. His survivors included his wife Jerusha, and their children Ivory H., Lucy Colomy Foss, Ada Jane Goldsmith, Charles W., and John M. (and perhaps Mary F., if alive). All the children were adults except for John, who was about 13. The first document, dated February 23, 1866, appears to be Jerusha’s petition to have Ivory H., who was living in Dover, Strafford County, New Hampshire, be administrator of his father’s estate. The reason was “there being no son or daughter of age nearby in this state”. This tells me that all the children (except John, of course) have moved away. Perhaps Ivory H. lived closest to Jerusha; after all, Strafford and York counties are only separated by Salmon Falls River. Jerusha signed this document with an “X” (“her mark”). This appointment was approved on May 1 by Judge E.E. Bourne in Saco, Maine. Also dated May 1 is a bond, signed by Ichabod G. Jordon and George Moore of Berwick, pledging themselves as sureties for Ivory H. to perform his duties as administrator. It seems that the first duty was to inventory the estate within three months. The document is signed by both men and by Ivory. The sureties were bound $1600 to the court. We also learn that the judge’s full name is “Edward E. Bourne”. Ivory H. makes a statement dated October 2, 1866 that his father died intestate (without a will), and that Ivory’s personal property was not sufficient to pay the court fees, so a sale of real estate would be necessary. The judge signed off on this document. On October 2, 1866 – Ivory H., who now lives in Wolfeborough, Carroll County, NH, signs a new bond with sureties Ichabod G. Jordon, and Alonzo B. Wentworth. bound to Judge Bourne for $1600. Connected with Ivory being licensed to sell the real estate. October 3, 1866 Administrator’s Sale – to sell Ivory’s real estate at public auction at the store of Walker & Farmington in Berwick on November 10. Includes description of his land: two acres and buildings bound Easterly by Sullivan Lane, Southerly by Ivory M. Nute’s land, Westerly & Northerly by Samuel W. Fox. Also part of the sale: the family pew at Cranberry Meadow Meeting House. (through a little internet research, I found that Cranberry Meadow Meeting House was the early incarnation of Berwick’s current Methodist Church, so now I know the family was Methodist.) Ivory H. signed two statements, which were sworn before Ichabod G. Jordon, Justice of the Peace (remember, he was one of the sureties). One statement was regarding posting notifications for the sale, and the other was regarding the payment of $200 for the debts and charges of the sale. This page with its statements was returned to Judge Bourne, who signed on January 1, 1867. This page gives some very specific information about where Ivory and Jerusha lived in Berwick. Although Sullivan Lane no longer exists, there is a Sullivan Street. More on the land later. November 6, 1866 – petition by Jerusha for an allowance from Ivory’s estate. She was granted ninety-seven dollars and seventy-eight cents. January 1, 1867 – First account of Ivory’s estate. Basically, a balance sheet. Amount of personal estate plus sums received = $630.78 (outlined on Schedule A). Amount of sums paid on Schedule B, plus publication of notices = $694.41. Approximate location of Ivory Goodwin’s land. Courtesy Google Earth. To conclude, the probate packet may not have answered all my questions about Ivory Goodwin, but it sure lent more information to color my picture of him. Frances A. 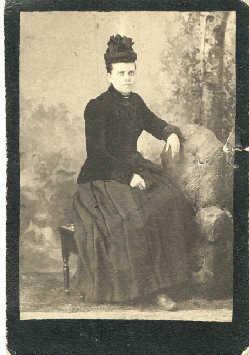 White, commonly called Fanny (or Fannie), was born, I believe, in 1846 in Yarmouth, Nova Scotia. She was the oldest daughter and fourth child of Job R. and Elizabeth Phoebe White. Fanny seems to be the first of her family to immigrate to the United States, though I’m not sure of those circumstances. On July 8, 1868 she married Harmon S. Burns in Lynn, Massachusetts at the age of 22. Harmon S. Burns was an older widower who was born in Vermont around 1828. Like so many people in Lynn, he worked in the shoemaking industry. Their marriage being the first record where I find Fanny’s name and age, I have calculated her birth year to be approximately 1846. As time went on, as we shall see, Fanny seemed to shave a few years off her age! The 1870 Census shows Fanny and Harmon living in Lynn with his adult son Alfred and her sister Jennie, as well as border Lizzie Clark. Fanny had not aged at all in two years, as her age here was 22. Fanny only appears to have aged 10 years by the 1880 Census, where she and Harmon are living along at 27 Cedar Hill Avenue in Lynn. However, they were not alone for long. On May 2, 1882, daughter Lena M. was born (the register of births shows her as unnamed). On May 6, 1884, daughter Elsie F. was born. I’m sure these daughters brought their parents much joy in the aftermath of their siblings’ deaths. By 1900, the Burns family and lodger Everett Kent were living at 38 Cedar Hill Avenue. (Fanny aged only 15 years since 1880!) They moved there around 1889 and if my calculations are correct, they would have been next door neighbors to Fanny’s sister Jennie and the Colomy family during Bertha’s trouble with Percy St. Clair. The next few years brought many changes for the family. On March 11, 1901, Harmon died of gangrene. He was buried at Pine Grove Cemetery at Public Lot-4, Section-22. On November 6, 1902, Lena died of tuberculosis. She, too, was buried at Pine Grove at Moss Path, Lot-692. The following year on January 3, Elsie had married James L. McNichol. That marriage did not last, as they were no longer together as of 1910. And on August 29, 1908 at the ripe old age of 44 (losing three years over the past eight), Fanny married 40-year-old divorced Edward H. Ives. By the 1910 Census, Edward, Fanny and Elsie moved to 30 Dana Street in neighboring Revere (where Fanny did gain the necessary two years to become “46”). Later that year, on October 26, Elsie married William Younie in Boston. They eventually had a daughter (Bernice Elsie) and a son (William, Jr.). Sadly on February 25, 1917, Elsie died of a cerebral hemorrhage and was buried in Pine Grove (location unknown at this time). Once again, Fanny buried one of her children, this being her last. To add insult to injury, Edward died of a cardiac lesion that year on October 7. I can’t be 100% sure that I have found Fanny in the 1920 Census. There is only one “Fannie A. Burns” in Massachusetts, who was an inmate in the Westborough State Hospital (a mental hospital). She was listed as married and age 61. Her parent information is not correct, but perhaps whoever put Fanny there did not give the hospital that information. In any case, I have to wonder if Fanny may have been committed there in light of all the tragedies she faced in her lifetime. Fanny herself lived five more years, passing away in April 1925. Although I am not sure of where Edward Ives was buried, I do know that Fanny is buried next to her daughter Lena in Pine Grove Cemetery. According to Find a Grave, her age at death is 66 years old, which does line up with the “Fannie” in the 1920 Census. So how old was she at death, really? I say she was probably 78 years old. I was fifteen years old in 1980 when my paternal grandfather died. My family went up to Salem, MA, to stay with my grandmother a few days and take care of the proper arrangements. I opened it up and found old newspaper clippings carefully pasted on each page. And what were the clippings? Every chapter of “All Quiet on the Western Front.” Although I was never crazy about the story, the fact that someone in my family put this together intrigued me. I supposed it must have been my grandfather’s, so I decided to keep it. Like so many other family mysteries, I never asked questions about it. My grandmother lived with us for years, and I never asked her whose it was, or how it came to be. (And she would know; she had related extensive genealogical to me that I later discovered was all true.) I never asked my dad about it; who knows? It could have been his. I never asked my aunt, who was such a bookworm and likely would have read it. And now they’re all gone. So now I’m left with the book. 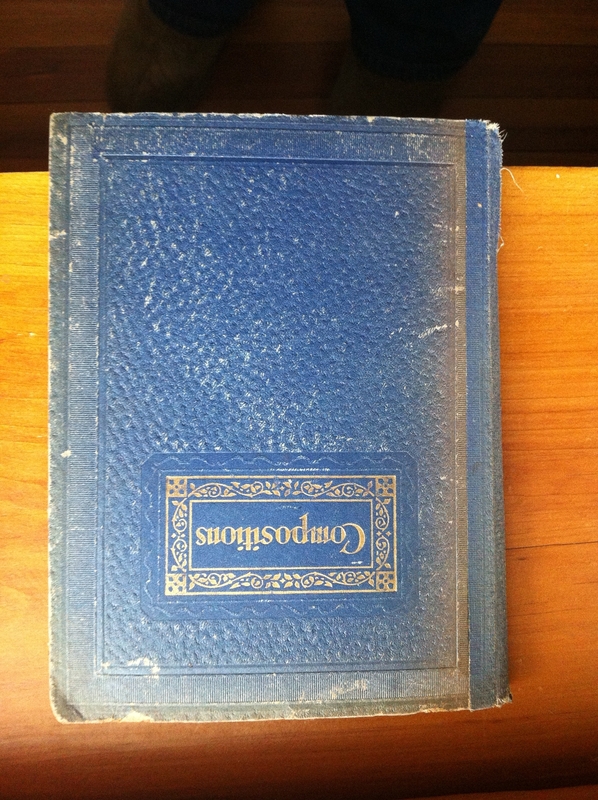 Some of the center pages of the notebook were carefully cut out, but pages were not removed from the story; it must have been done before the story was pasted in. 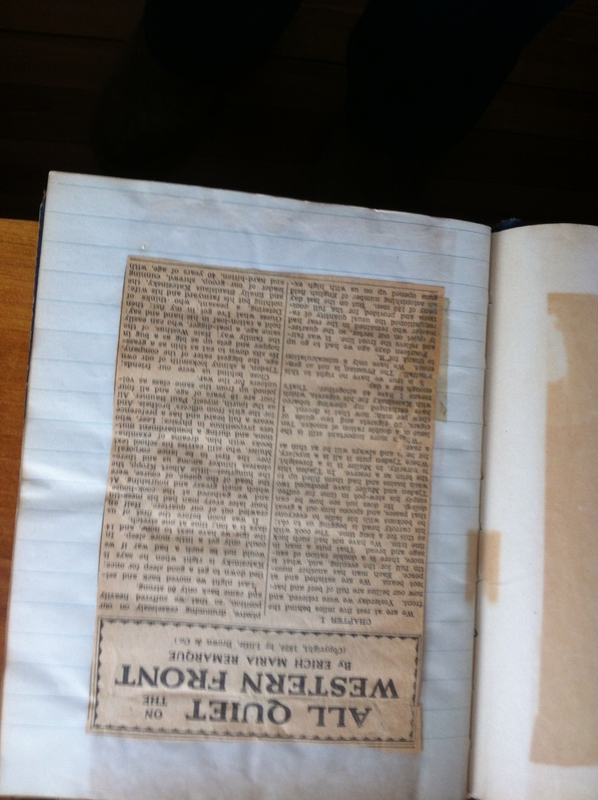 Whoever cut out the story cut out whatever newspaper it came from and whatever date it was printed. There is no writing anywhere in the notebook. when was that style of composition notebook made? what newspaper might have published the story and when? I could do search on the phrase before the one instance of “(continued…” that I found. If I get the answers to these questions, I can narrow down whose notebook it was. If it was Baltimore, Maryland, then my imaginary story of my great-grandfather George Pleau sitting down with my grandfather would be true. If it was the Lynn/Boston, Massachusetts area, it’s a whole other story. Maybe my great-grandfather Thomas F. Atwell, who fought in World War I (albeit in the Navy) put it together. Maybe the story was published much later and it was my dad who assembled it. We’ll see what the story will end up being. All records indicate that Edwin Scott Colomy was born to Frank Colomy and Jennie White on Oct 28, 1878 in Lynn, Massachusetts. Like his father Frank and grandfather George, there are times in Edwin’s life that finding a supporting record has been hard! However, we are able to find out much about him. Like his progenitors, he worked as a shoemaker from 1898 to 1906. It was a profession he returned to from 1909 to 1911 and finally in 1914. I suppose that, living in Lynn, this was a path that many took. Edwin married nineteen-year-old Mary Abbie Johnson in July 3, 1899, the ceremony performed by L.J. Thomas. At first, they lived at home with his mother Jennie and sister Bertha until 1901 (probably when Jennie married James Starbard), then a couple of years with his father Frank and grandmother Lucy at 52 Lynnfield Street. Finally in 1904 they settled in their own place at 43 Springvale Avenue. Both Edwin and Mary were involved in Masonic organizations; Edwin at the Knights of Malta and Mary was a Mistress of Finance at the Paul Revere Temple. Later (between 1908 and 1919), Edwin was also involved at the Paul Revere lodge. In 1906 so many changes came into Edwin’s life. He became a conductor on the Boston & Northern Railroad. And on April 4, 1906, Mary gave birth to their son, Roy Edwin Colomy. The joy of new parenthood was short-lived, however. It seems that Mary probably did not recover from childbirth as she should; she contracted metritis, an postpartum infection of the uterus, which led to septicemia. Back then, there were no antibiotics; there was no cure. Mary quickly succumbed to her illness on May 11, leaving Edwin and Roy behind. Mary was buried in her family’s plot in Pine Grove Cemetery (Spruce Avenue, Lot 447), with the inscription, “Mother of Roy E. Colomy” on her tombstone. Of course it was unusual for a man to be raising a newborn alone. Mary’s parents, Charles Johnson and Vera Torrey, took Roy in and raised him until his grandmother’s death in 1915. Meanwhile, Edwin worked as a salesman, a shoe cutter, and a salesman again. Although he moved briefly to nearby Malden, Middlesex County, Massachusetts, it seems that he found time to spend with his son. 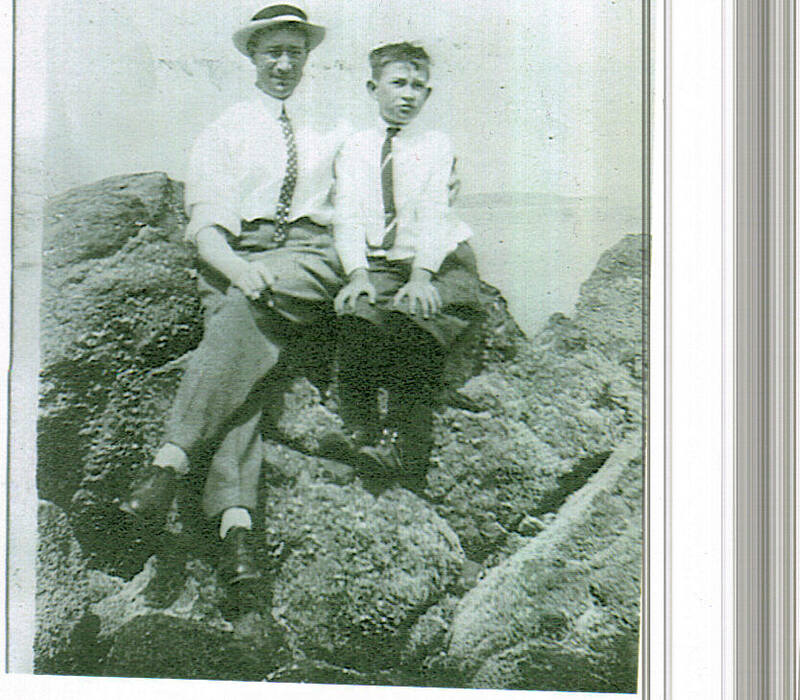 Edwin and Roy Colomy; I’m guessing this might be Red Rock in Lynn, MA. Courtesy Deb Thompson Colomy. 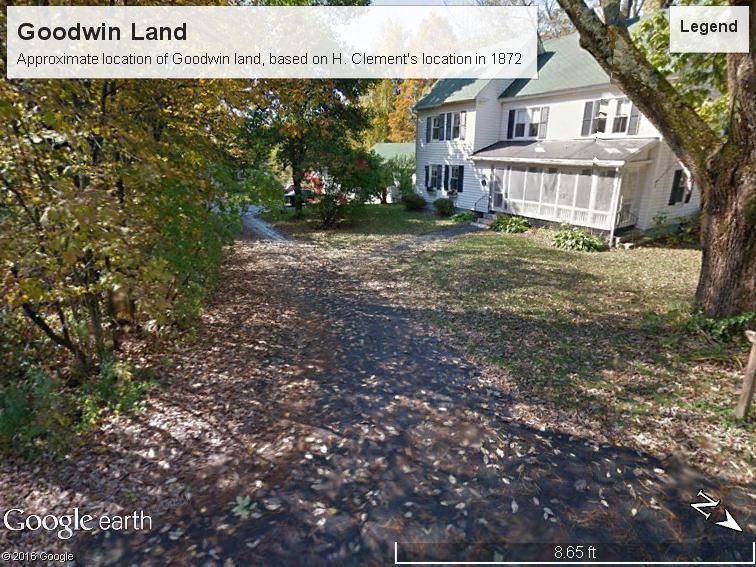 In 1914 Edwin moved back to Lynn to his mother’s house. It seems that Edwin found love again! On April 17 he married widow Eleanor Mabel (Roach) Elwell, the ceremony performed by Arthur E. Harriman. They lived with Edwin’s mother Jennie till her 1915 death. I assume that after Vera (Torrey) Johnson’s death in April 1915, Roy moved into the home at 63 Autumn Street. I can only wonder about his youthful thoughts, having seen both grandmothers die within the same year. It wasn’t long before the Colomy family moved just a few blocks away and began to rent at 24 Lafayette Park, which was to be Edwin’s home until 1927 (and has a lovely view of Goldfish Pond). On July 21, 1916, the family expanded as Mabel Eleanor was born. 1918 was the year that Edwin began his five-year stint as owner of a variety store at 59 Ocean Street (it doesn’t appear that this location is still standing). 1918 is also known as the year of the deadly influenza epidemic. I was just reading that it was bacterial pneumonia occurring as a result of the flu that lead to most of the deaths in 1918 – 1919. Eleanor had contracted pneumonia, and I wonder if it may have been part of this epidemic. Sadly, she passed away on December 11, 1918. She was buried two days later in Plot F, Lot 59 at Pine Grove Cemetery. 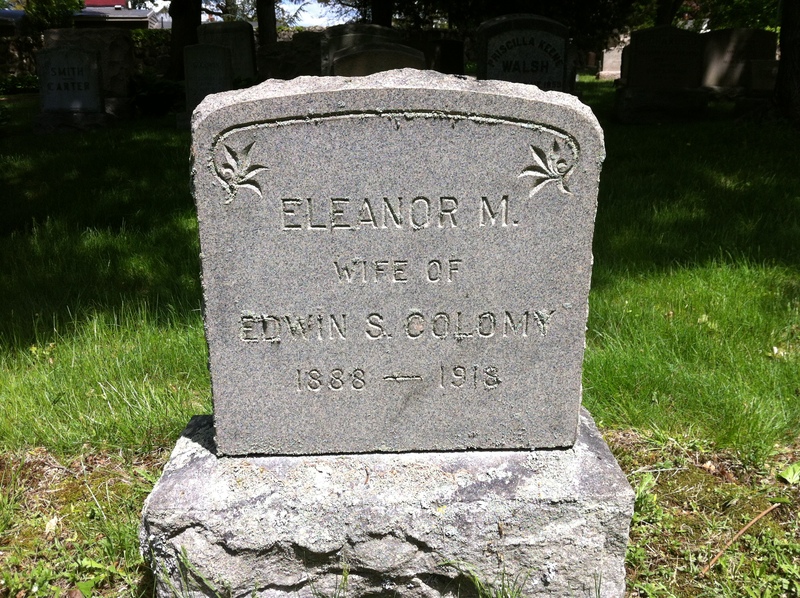 Edwin obtained a two-person plot, and made sure “Wife of Edwin S. Colomy” was inscribed on her stone. Eleanor Colomy’s final resting place. Author’s collection. At this time, Roy was twelve years old and his little sister Mabel was two. To me, this seemed like an arrangement that Edwin might be able to handle, as opposed to when Roy was born. If either child stayed somewhere else after Eleanor’s death, I don’t have any record of it. And perhaps his childless sister Bertha was able to watch the children as he worked. Well, wouldn’t you know that good fortune smiled on Edwin again. No later than January 12, 1920, he met and married Pearl (whose maiden name I believe was Hutch). The family of four was together for a time; however, it seems that Roy joined the Navy for a period and eventually ended up in the Philadelphia area, where he met Marguerite Olive Fry. Based on their 1930 Census answers to “age at first marriage”, it seems that they got married in 1924. They went on to have eleven children, some of whom I believe are alive today. Roy and Marguerite stayed in the greater Philadelphia area, moving to southern New Jersey. Marguerite died in 1974 and Roy later in 1986. Both are buried in Rose Hill Cemetery in Newfield, New Jersey. Meanwhile, Edwin continued on with his involvement in the Masons, being part of Mt. Carmel Lodge from 1923 to 1933. He also went back to being a salesman in 1925. This makes me wonder if Edwin had an outgoing personality. Sometime between 1928 and 1930, Edwin, Pearl and Mabel moved to Winthrop, Suffolk County, Massachusetts. Edwin and Pearl remained there for many years. Shortly before 1940, Mabel married George Willis Archibald. They went on to have two children and eventually moved to Stuart, Martin County, Florida. The Depression and World War II must have had an impact on Edwin’s usual salesman occupation, for in 1942 he worked for the Works Progress Administration. Of course, that job probably only lasted as long as the WPA did. Edwin eventually went back to sales, probably with the post-war boom. As they got older and probably because they were so far away from both of his children, Edwin and Pearl moved to Stuart, Florida in mid-1951. They had only a couple of years to enjoy the sunny weather, for on January 8, 1953 Edwin died of coronary thrombosis. He was buried on January 14 at Fernhill Memorial Gardens and Mausoleum in Stuart, where his daughter Mabel was later buried in 1967. Much more can probably be said about Edwin and his progeny, but at this point I enter into living memory and territory more familiar to my cousins than I.
Jane E. White (just about always called Jennie) was born circa 1855 in Yarmouth, Nova Scotia to Job R. and Elizabeth Phoebe White. She was the youngest daughter and second youngest child out of a total of eight children. Her older siblings were: Edgar Douglas, William Faulkner, John David, Frances A., Milton K. (later James M.) and Mary Roberts. Her younger brother was Theodore W.
Previously thought to be a picture of Bertha, the identified time points to it being Jennie. 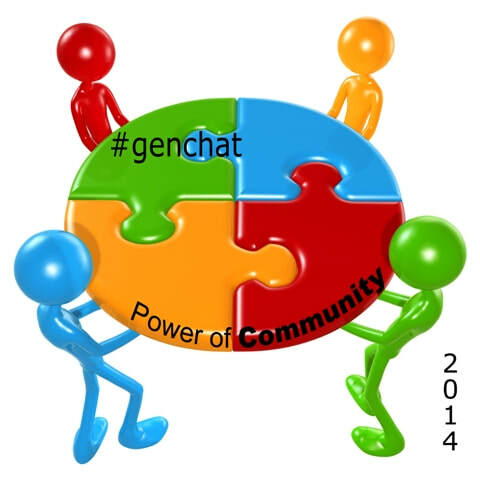 Courtesy Deb Thompson Colomy. It appears that most of the White family immigrated to the United States in the late 1860’s to live in Lynn, Massachusetts. For some reason, Jennie lived apart from her parents, with her sister Fanny and brother-in-law Harmon Burns, in 1870. Perhaps that was close to her job as a machine stitcher (probably in the shoe making industry). On January 17, 1873 Jennie married John Williams, who also worked in the shoe making business (maybe they worked together?). Their married life was very short-lived however. John contracted consumption and died on July 21, 1873. As I wrote here, Jennie and her sister Mary found themselves pregnant and on October 11 1875 married Frank L. Colomy and John M. Goodwin respectively. This pregnancy resulted in my great-grandmother Bertha. On October 28, 1878 Edwin Scott was born and on January 4, 1883 Jennie gave birth to an unnamed stillborn son. From we’ve seen from Frank’s frequent absences, Jennie functioned basically as a single mother much of the time. When the children were young, she took in boarders, and as we saw here, she relied on Bertha to supplement the family income. It is no surprise that Jennie and Frank were divorced by 1900. Eventually Jennie found love again. On July 24, 1901, she married James Starbard, a widower and a shoe trimmer. Like Jennie, this was his third marriage. Jennie moved to James’ home at 63 Autumn St.
James and Jennie were married ten years when James died of nephritis on November 23, 1911. It seems that her son Edwin lived with her and James during this time, and later just with Jennie from 1914 until her death on December 28, 1915. Like James, she also died of nephritis. Both James and Jennie were buried in Pine Grove. 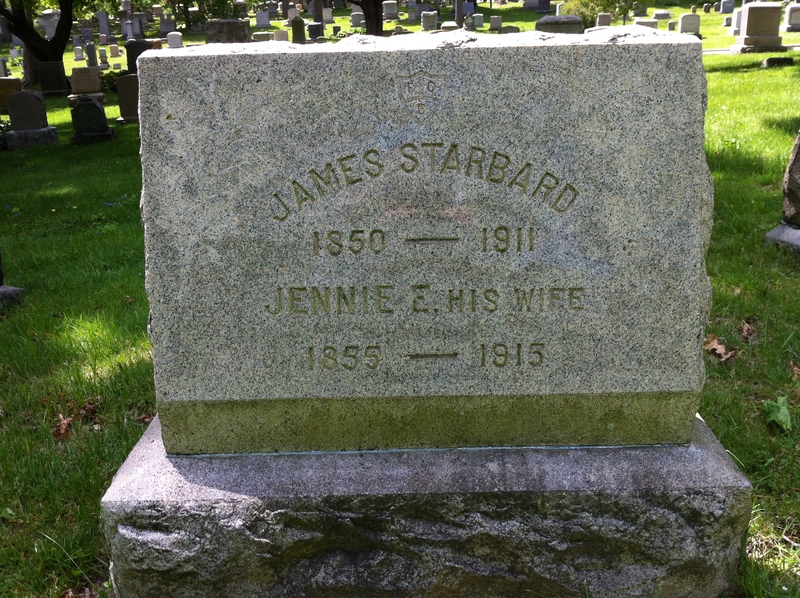 James and Jennie Starbard gravestone. Author’s collection.